Made for Alle M�ller, the well-known Swedish musician, this mandola has a fingerboard extension on the G string that allows him to rapidly retune without a capo. If you can't find what you want in our ranges, then it probably doesn't exist - but we can build it for you! As makers we're always looking for a challenge and to extend our knowledge and abilities. 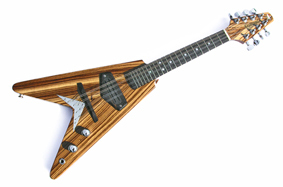 We have made many one-off instruments for musicians seeking something that little bit different. Here are a few examples. Click on a photograph to enlarge it. This musician wanted some extra drone strings, so he got them - 15 in fact! For you and the love in your life? Figured sycamore and spruce; stained, high gloss finish; Oakwood oakleaf inlays and names on top. Specialist items for an early music enthusiast. And sometimes we make things just for fun! We have also made a spinet and a clavichord! An early music performer asked us to make a copy of an 18th century english guitar. The challenges included the domed rose and the capo fixed through the neck. This instrument is made from figured sycamore and spruce, stained to match the original, and sounds very sweet. The electric hardanger was based on our existing electric violin. The headstock, as well as accommodating the extra strings, reflects the traditional form. The customer also wanted fine tuners on the sympathetic strings, resulting in a new tailpiece design. Another project involved building a guitar with sympathetic strings. This also meant customising the head, bridge and tailpece. Another customer wanted an electric bouzouki - in the style of a Gibson SG! This harp guitar is based on an original design by William Eaton - a fine musician, luthier and director of the Roberto-Venn School of Luthiery. 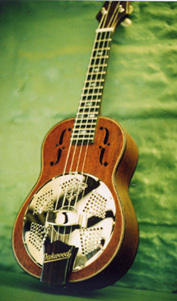 Wicked electric mandolin for Ian Harvey - and thanks, Ian, for the pictures. The stripey wood is called zebrano.